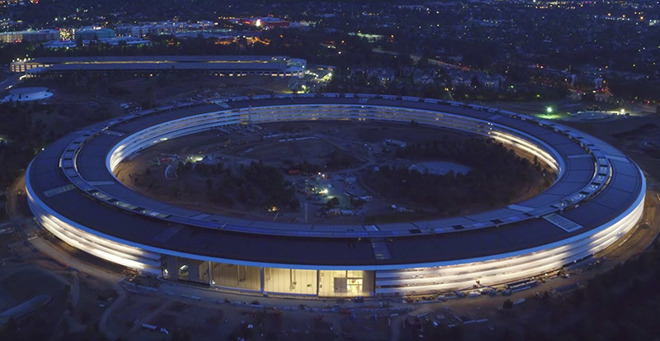 Drone pilot Duncan Sinfield is back with his monthly Apple Park construction update, this time showing off aerial views of the main "spaceship" building lit up at night. Though there remains much to be done in the way of landscaping and interior decorating, exterior work Apple Park's main structures is largely complete. As seen in the drone footage below, contractors are busy making the central office building ready as employees prepare to move in to their respective "pods," or working groups. Solar arrays blanketing the central building's roof appear to be completely installed, though whether they are functional remains unknown. As seen in previous drone videos, lighting within the large circular structure, as well as in ancillary buildings and light posts dotting the vast campus grounds, is active. A good portion of the video focuses on the café, a large, open space protected by two massive glass doors operated by underground machinery. No furniture can be seen in today's release, though it is possible that Apple has since filled the space with tables and chairs to accommodate the 12,000 employees that will one day soon meet in the communal area. Earlier this month, Wired took a tour of Apple Park with company executives, who explained the process of building a multi-billion dollar campus. Along with the usual platitudes about environmentally sound design, the feature explored Apple's design genesis with architect Norman Foster, as well as intricate details like custom doorhandles and elevator buttons. A great deal of Apple Park can be traced back to late Apple cofounder Steve Jobs. The tech guru had a vision for the campus and much of that came through as part of the final product. For example, a two-story yoga room in Apple Park's fitness center is covered in stone sourced from a quarry in Kansas then distressed to mirror Jobs' favorite hotel in Yosemite. Jobs' spirit lives on in the Steve Jobs Theater, a 1,000-seat underground venue that sits atop a manmade hill overlooking the "spaceship."